i.b.s.® International Operative Services e.K. 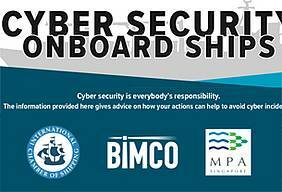 Joint maritime industry associations have recently released the latest industry guidelines on cyber security onboard ships, which covers cyber risks in a ship’s safety management system, risk assessments for operational technology and offers guidance for onboard cybersecurity threats arising from the external supply chains. The guidelines also includes anonymous examples of real-world cyberattacks on ship owners and operators, including examples that highlight increased threats to human life emanating from cyberattacks on operational technology, as well as an increase in malware infections from third-party suppliers. © 2019 i.b.s.® International Operative Services e.K. i.b.s.® founded in 1996 and member of the "i.b.s.® Group" of company's is ISO 9001:2015 certified by the "DNV-GL" as a commercial provider of international armed security services including maritime security, consultancy and training. In addition i.b.s.® is certified and registered by the Governments of Belgium, Germany, Lithuania and the Sultanate of Oman as a provider of commercial security services as well as a Governmental approved commercial security consultant.